After numerous failed rumours of incoming players at Dortmund, Tuchel’s side went into the 2nd match-day of the Rückrunde with a rotated squad which showed their limitations as they struggled against Ingolstadt. A returning Erik Durm started at left-back whilst Ramos took on an awkward role on the right wing. If that wasn’t enough, a particularly-masochistic Thomas Tuchel decided to fill Gündogan’s absence by giving Matthias Ginter a start in that right-sided 8 position. With a depleted squad as the likes of Gündogan were rested, Dortmund struggled for the majority of the match and their possession game looked particularly weak without the crucial influences of their key players. In attack they were slightly wing-oriented in isolated attempts due to the poor support from the centre. On the left, Mkhitaryan was less than his usually effective performance and appeared to be missing the presence of Marcel Schmelzer, whose ability Durm failed to match. Being such a strong collective-oriented player, Mkhitaryan benefits significantly from strong players around him and with Durm’s limitations as a player, attacks down the wing suffered as a result. Similarly the attacks down the right side were weak as Adrian Ramos was evidently out of his natural position as a winger. The Colombian striker played quite an awkward-looking role as he was positioned high up and at times looked closer to a second striker especially with the movement of Aubameyang. With quite a limited range of attributes, he struggled massively in supporting the development of possession and progression of the ball down the right half-space and flank was difficult. 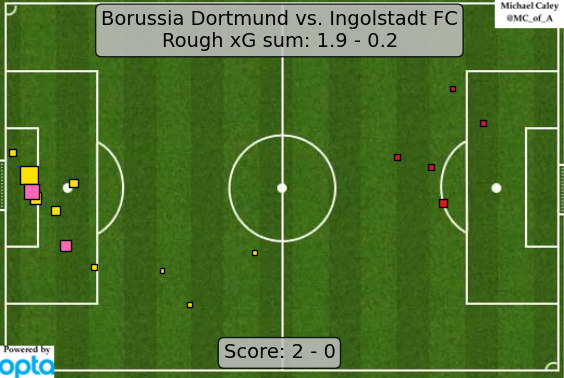 On a collective level, Dortmund didn’t seem as ball-oriented in their positioning as we have become accustomed to. Especially in wide areas, the midfield didn’t shift towards the ball a great deal and the connections suffered because of this. As the 2nd half progressed, the home side did improve to some extent in this area, with good support from the movements of Castro once he was introduced. Dortmund improved over the course of the second half with some good substitutions. The final one saw Ramos come off of the pitch to be replaced by debutant Christian Pulisic. The young American player is one of the most promising players after joining the club 2 years ago from his home country. In his introduction in Saturday’s game the 17-year-old looked comfortable as he impressed from a left-wing position, showing good intelligence with some promising technical ability in his dribbling and passing. In the build-up to the 2nd goal, Pulisic created space for Castro to make the assist through a clever run towards the right from the left half-space. Particularly in comparison to Adrian Ramos, the American was much more effective in the wide role. He was evidently more active off of the ball and would make frequent movements to receive possession, which were usually down the left flank or in the adjacent half-space. In possession he made a couple of promising runs, particularly down the left where he could beat his man through a change of pace to then fire in low crosses into the box. For more on the young American, I recommend reading Luca Gierl’s article. For the criticism of Dortmund’s first 70 minutes, credit must be given to an Ingolstadt side who defended well for the most part. Without possession they defended in a narrow 4-1-2-3 shape which had a decent level of control over the central passing lanes. 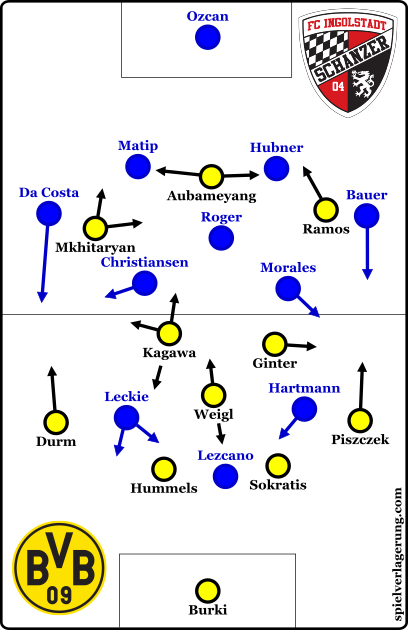 They used clear man-orientations as the away side looked to press Dortmund and restrict their possession game. The man-marking allowed them to have quite a good level of access and did well to restrict Dortmund’s use of their key players in midfield, such as Weigl and Kagawa. Sometimes during the press, there were periods of instability as their narrow shape left the full-backs temporarily open. With the man-marking, Lezcano would drop slightly deeper to cover Weigl whilst the two wider forwards would cover their respective centre-backs. Deeper in midfield, more orthodox match-ups were made. With Ramos in particular high-up and wide, Ingolstadt didn’t have a player who had a clear responsibility to cover the full-backs and due to the man-marking, found it difficult to react once the ball moved to Piszczek. For the large majority of the game, this never amounted to a serious problem however. Dortmund looked to exploit it largely down the right touchline yet when Piszczek received possession, he wasn’t often in good company with Ginter and Ramos the nearest supporting players. A prime example of this came early in the 2nd half, where Piszczek found the ball and moved it inside to Ginter who had plentiful space around him. Yet the German moved the ball too slowly and resorted to a pass to Ramos on the wing. In a weak position, he laid the ball off to Piszczek in an attempted one-two yet when Ramos made the run behind, the connections were simply too weak and they lost possession through an intercepted pass. In this scene, Ginter’s starting position was strikingly reminiscent of Gündogan’s before he assisted Marco Reus in the opener for last week’s win over Gladbach. Their lack of coverage eventually came to hurt Ingolstadt however as it was a crucial component in the 1st goal. Receiving the ball from Bürki, Hummels cleverly dribbled past Lezcano and immediately broke the press, highlighting a prime issue with man-marking. Because every player is occupied with their own man, it only take the on-ball defender to be caught out and the ball-carrier becomes free with the defending team unable to develop access. Without pressure, he drove the ball to a point just inside his own half before switching the ball out wide to an alone Piszczek. The full-back continued to carry the ball forward, likewise without any Ingolstadt pressure, before crossing to a slightly-offside Aubameyang. The African player of the year finished the pass well to finally break the deadlock. Michael Caley’s xG map. Click the image to be taken to his excellent twitter. In attack, Ingolstadt were very direct and played many long balls down the centre where the front three were closely-distanced in an attempt to maintain possession following that. In more developed possessions, they were somewhat wing-oriented with Da Costa particularly high down the right as the ball-near winger would drift towards the touchline in support. The away side however were simply too harmless against Dortmund, and their small number of shots amounted to just 0.2xG throughout the whole game, with only one being in the penalty area. A key point out of this win was Dortmund’s lack of squad depth, despite their eventual win over Ingolstadt. They struggled through large periods of the game and distinctly missed Gündogan as Ginter simply couldn’t match the world-class quality which the former brings. With the window shutting soon, it will be interesting to see if Zorc and co. will be making a signing, especially after allowing two rotation players in Januzaj and Hoffmann to leave. Particularly with European matches soon returning, they may be forced to do so as despite Pulisic impressing in his 20 minutes, youth doesn’t seem a sustainable option over the course of the season.